If it has been a while since you last addressed your Estate Planning Documents, you should be aware that Virginia has changed its laws in the last few years and Congress has passed the American Taxpayer Relief Act of 2012. What Congress did was to make permanent the system in effect for the past two years. The new legislation changed the gift and estate tax rate to a top rate of 40% from a prior top rate of 35%. We recommend that you make sure that either your Last Will and Testament or Living Trust passes your assets to your heirs and beneficiaries in the manner you believe appropriate. If you die without an effective up to date Last Will and Testament or Living Trust the law of the Commonwealth of Virginia will determine how most of your assets would be distributed, and the result may not be what you would want. You have a right to make your intent known but you must have documents that carry out that intent. We offer to review the issues set out in the attached memorandum that we have prepared to give you guidance in reviewing your estate planning documents that includes wills, trusts, powers of attorney and advance medical directives. You may also wish to assess your current estate plan. When you fill out the attached estate planning questionnaire it provides an interactive method of assessing your current assets and directions. You may print this out or e-mail it back to us at firm@bartlettspirn.com . Please call us to set up an appointment for this review at 757-229-1910. 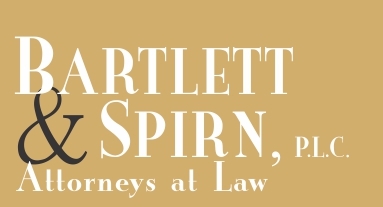 2016 Bartlett & Spirn, P.L.C. All Rights Reserved.